Dacula, GA, in North Central Georgia at the southern tip of the Appalachian Mountains, enjoys a mild climate with four seasons that must be taken into consideration when landscaping. Autumn leaves are beautiful, but fallen leaves can impede the growth of your lawn. Landscape contractors in Dacula are often asked whether to rake leaves and haul them to the curb in bags or use a mulching mower, a lawn mower with a mulching blade that chops leaves into tiny fragments. Experts in landscape design in Dacula, GA, will tell you that there are advantages and disadvantages to either approach. Mulching takes less time and less manual effort than raking and bagging leaves. The shredded leaves decompose, adding nutrients to the soil without damaging your grass. Just be careful not to let the mulch layer get more than ¼-inch thick. Mulching is easier on your wallet. You save money by not having to buy mulch, plus you save on weed control. Decomposing leaves decrease dandelions and crabgrass after mulching fall leaves for just three years. Mulched leaves keep the soil warmer in winter and cooler in summer. The nutrients they provide reduce the amount—and the expense—of fertilizer required in the spring. If you don't have a mulching mower or mulching blade and use a side-discharge lawn mower, you'll want to begin on the outside edge of your lawn. That will shoot the leaves toward the middle of the yard. That way, you won't cover the driveway and sidewalk with debris. If the pieces of leaves are still too large, just mow over them again at a right angle. In Dacula, if you choose to mulch, you'll want to mow every four to five days. You may need to make multiple passes to shred the leaves. If the leaves have dried, be sure to wear a dust mask and goggles. 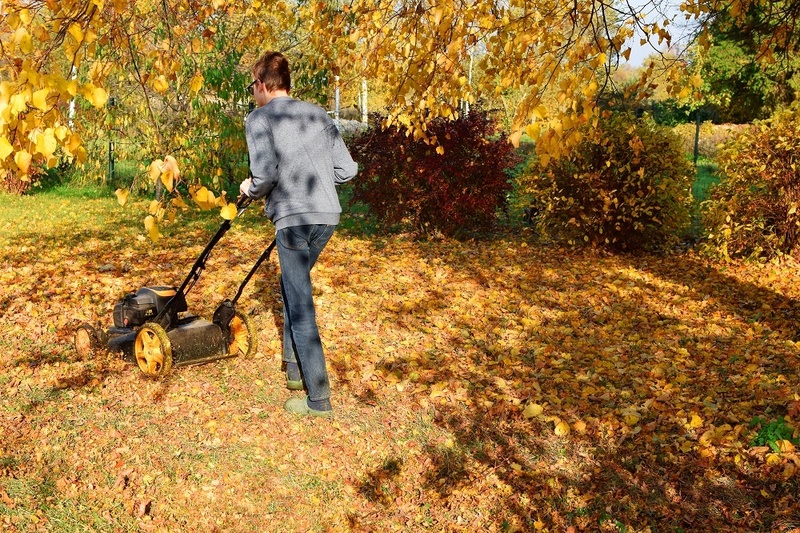 Be aware that wet leaves can clog and strain the mower. Also, note that mulching won't work if you have pine trees. Pine needles decompose too slowly, and that can smother the grass. Some people prefer to rake rather than mulch. 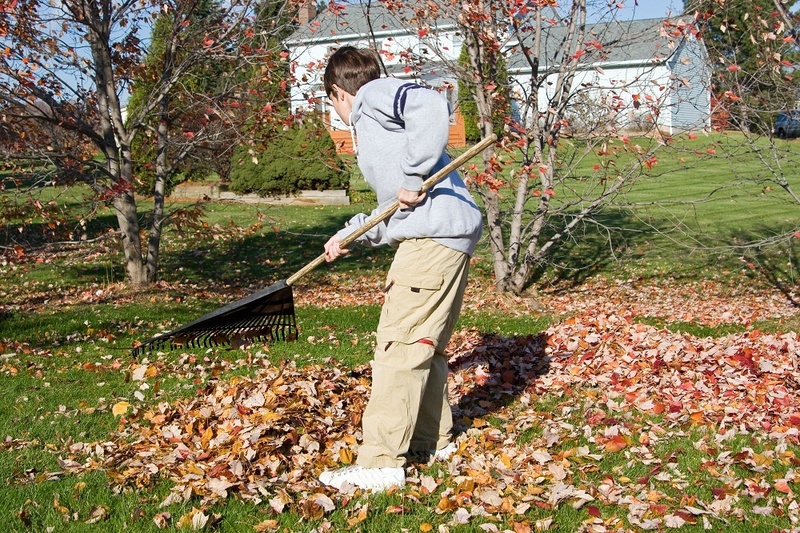 Raking leaves is good exercise and it leaves a clean, attractive yard. If you decide to rake, just make sure you have plenty of bags—it usually takes more than you think it will. You can add the leaves to your compost bin. Some towns will pick up bags of leaves and take them to public compost piles. Other municipalities don't allow leaves in landfills. Another factor that may affect your decision whether to rake or mulch is hardscaping in Dacula. Hardscape refers to the nonliving, man-made elements of landscaping, such as paths or walls, a brick patio, a wood arbor, or firepit. For hardscape ideas in Dacula, talk to the landscape designers at Stoeckig Landscape Group. They can create a showcase for flowers and plants from a formerly unusable slope. Hardscaping can add enhance any yard. Using natural stone, wood, synthetic materials, and decorative items, our designers can transform any space. Hardscaping and landscaping in Dacula, along with your personal preferences, your neighborhood, and your town, all impact your decision whether to mulch or rake those fallen leaves.